Each act of denial, conscious or unconscious, is an abdication of our power to respond. Joanna Rogers Macy was born in California, USA. 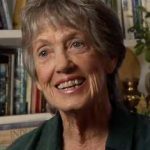 She is an American environmental activist, author and scholar of Buddhism. She graduated from Wellesley College in 1950 and received her Ph.D. in Religious Studies from Syracuse University in 1978. She is an international spokesperson for anti-nuclear causes, peace, justice, and environmentalism. She has created a theoretical framework for personal and social change, and a workshop methodology for its application. Her work addresses psychological and spiritual issues, Buddhist thought, and contemporary science. She has written several books include: Despair and personal power in the nuclear age, Dharma and development, Mutual causality in Buddhism and general systems theory, Coming Back to Life (with Molly Young Brown), Widening circles (memoir), World as Lover, World as Self, Pass It On (with Norbert Gahbler), and Active Hope (with Chris Johnstone). She was married to the late Francis Underhill Macy, the activist and Russian scholar who founded the Center for Safe Energy.